Hi there! Thanks for stopping by and for your interest in a prewedding photoshoot in Amsterdam or other parts of the Netherlands! My name is Dario Endara. I am an American wedding and prewedding photographer living in the Netherlands. I specialize in prewedding photography and prewedding shoots in Amsterdam and the rest of Holland. The Netherlands / Holland is a great place for your engagement photos. Being a relatively small country compared to other countries in Europe, it is easy to cover various different places in the Netherlands in a full day prewedding shoot. 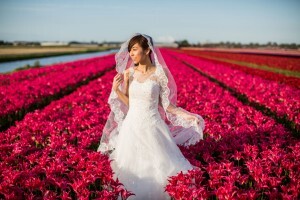 Read more below on some very popular destinations for your prewedding photo session in Holland. With its beautiful old Dutch houses along the many canals, Amsterdam makes for a great city to take photos in. During your prewedding photoshoot in Amsterdam, we usually start off around the Amsterdam central station, from where we continue into the old local neighborhoods with the canals. As there are many canals to choose from, we will walk down the streets to select the best places for photos. After the canals, we visit the famous Dam square with the Royal Palace in the background. Another iconic landmark in Amsterdam that is not to be missed is the famous I-AMSTERDAM sign in front of the world renown Rijksmuseum. For more information about my photography in Amsterdam, please visit this page. 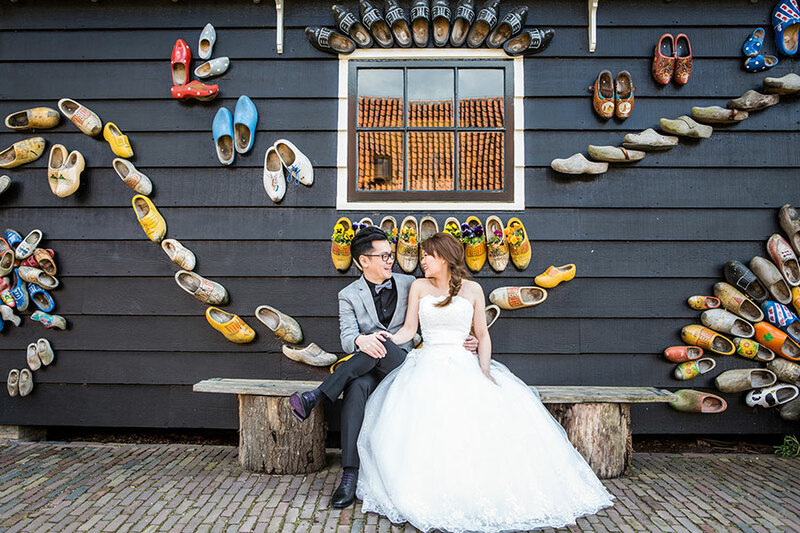 The traditional windmill village of Zaanse Schans, about a 20 minute car ride from Amsterdam, is a true iconic location for prewedding photos in the Netherlands. There are several colored windmills lined up along the water and we can even enter some! Besides the old wooden windmills, this town also has a cute little town with typical Dutch houses, a factory where they make wooden shoes and an animal park. The contrast with the busy city of Amsterdam couldn’t be bigger! Perhaps the most famous landmark in the Netherlands, and a very popular spot for prewedding photography in Holland is the Keukenhof flower garden. Every year between March and May, millions of tulips, daffodils and other flowers are blooming in this big park. The combination of the many colorful flowers, water and canals and cherry blossom trees in full bloom, give us the opportunity to take many different pre wedding photos in this park! The Keukenhof flower gardens are located about 45 min from Amsterdam and are easily accessible by car and public transportation. Just outside the Keukenhof flower gardens, there are many fields filled with different types of flowers. This is the image many people have of Holland and it does not dissapoint. Just like the flower garden, the best period to visit these flower fields is April and the beginning of May, when the fields are in full bloom. With so many different flowers, the combination of colors will lead to some very colorful prewedding photos! Perhaps the most beautiful castle of the Netherlands, ‘de Haar’ castle, set in a dense forest in the middle of Holland, is a truly unique location to visit during your prewedding photoshoot. This medieval castle has it all: Towers, moats and drawbridges. It’s truly the castle you see in fairy-tales. Set in a beautiful garden that looks like the Versaille gardens, this is the castle to visit during your pre wedding photography trip to Europe. If you would like to see some of my recent wedding photography and prewedding shoots in the Netherlands please visit my full portfolio. It contains recent examples of pre wedding photoshoots in Amsterdam. In addition, I love to photograph throughout various locations in the Netherlands, such as Keukenhof with its tulip fields and the Zaanse Schans with its traditional Dutch windmills. I look forward to hearing from you and photographing you!